There are several major types of business entities, including S Corporations, C Corporations, Limited Liability Companies (LLCs) and being self-employed. Each type of structure has its own advantages and disadvantages when it comes to taxes, assets and liability protection. Generally, certain types of businesses are best for certain professions from a tax perspective; however, with the tax law changes last year it may be time to reconsider. Under the current tax law, what used to be the best business entity type for certain scenarios may no longer be the same due to the pass-through deduction and corporate tax rate changes. Let’s look at the most common business entity types and see what’s best. The self-employed includes everyone who is a freelancer, independent contractor and many business owners who don’t have any partners. The nice thing about being self-employed is that it’s simple; you don’t need to set up any type of legal entity. Moreover, if you qualify for the 20 percent pass-through deduction, you’ll pay even less. Being self-employed is best for simple businesses without major assets and little potential legal liability due to the lack of protection. The self-employed are required to pay both halves of self-employment taxes on top of their regular income (if you are an employee, you pay one half and your employer pays the other) so you’ll need to take this into account. Aside from taxation, asset protection is a major consideration when selecting a corporate entity. For those who have significant assets that need protection, especially if they don’t have any partners in the business, an S Corporation may be the best bet. There are restrictions on ownership structure; for example, S Corporations are limited to 100 shareholders, so this might be a limitation for some. As a pass-through entity, an S Corporation doesn’t pay taxes on income at the corporate level; instead, it passes through to the business owners. As a result, S Corporations can benefit from the 20 percent pass-through deduction as well, though high earners may be phased out. S Corporations are generally favored by certain professions such as doctors, dentists and certain types of consultants. Unlike S Corporations, there are no restrictions on ownership for C Corporations, and they provide great asset protection. Therefore, almost all public companies and those that want to go public are C Corporations, such as start-ups. The downside of C Corporations is that they are subject to “double taxation.” The corporation is taxed on entity level profits and then shareholders are taxed again on dividend distributions. The dividend distributions are not deductible to the entity, hence the double taxation issue. The new tax law lowered the top corporate tax rate to 21 percent, so for high earners the double taxation issue is not as much of a consideration as it used to be. Also, Section 1202 allows shareholders of start-ups to sell their stock without any taxes on the first $5 million in gain after five years. LLCs are generally the preferred entity structure for certain professionals and landlords. 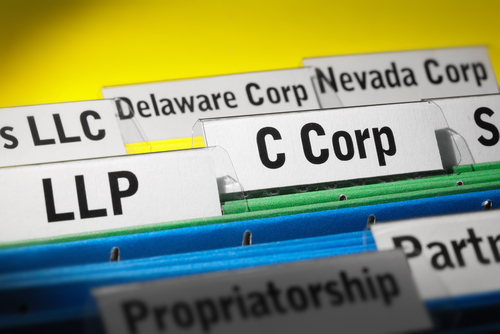 LLCs have flexibility as the owners can file as a partnership, S Corporation or even sole proprietor since the LLC is really a legal and not tax designation. LLCs benefit from the 20 percent pass-through deduction if the owner elects to be taxed as a pass-through, depending on the income level and nature of the business. Many states do charge annual fees or minimum taxes on LLCs, but it’s usually insignificant. California is one of the most onerous with an $800 minimum fee per year. Tax savings are often the main motivator in selecting a corporate entity, with asset protection right behind it. The new tax law’s 20 percent pass-through deduction and corporation tax rate reductions make the choice a little tougher than in the past, but generally unless a company wants to go public most businesses will either choose an LLC or S Corporation structure. Every situation is unique, so make sure to consult a professional that can help you choose the right entity type for your situation.